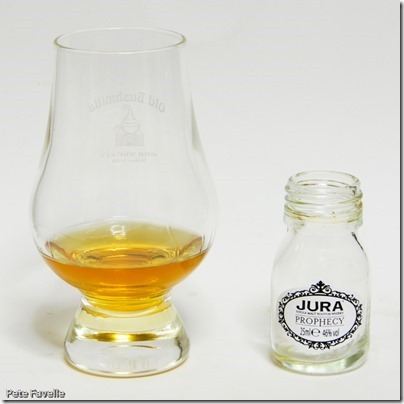 Jura is a distillery I’ve always struggled to love. This is frustrating because in general I love island distilleries, and being right next to the whisky heaven of Islay, it should be a perfect match. Then again, it’s possible that those very expectations are what cause me such trouble. 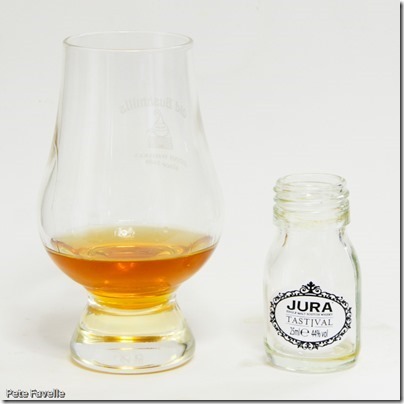 Jura isn’t Islay, and it doesn’t try to be. So, I’m going to try and put all thoughts of geography out of my head, and approach these whiskies as blind as I can. 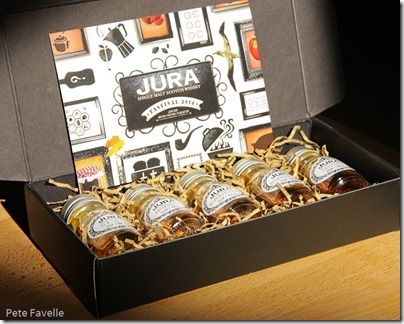 As part of their whisky festival this year, Jura released a special ‘Tastival 2014’ bottling and also produced a handy tasting set which covers both their core bottles and the festival special – and I’m lucky enough to have been sent one. 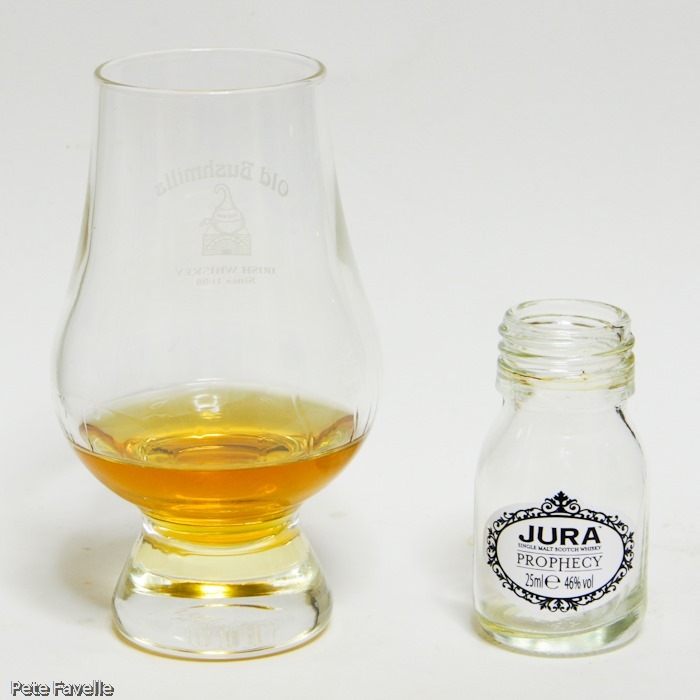 Origin is the first whisky produced by Jura, and is probably the most widely available. 10 years old, and bottled at 40% ABV, it’s a good entry level dram. 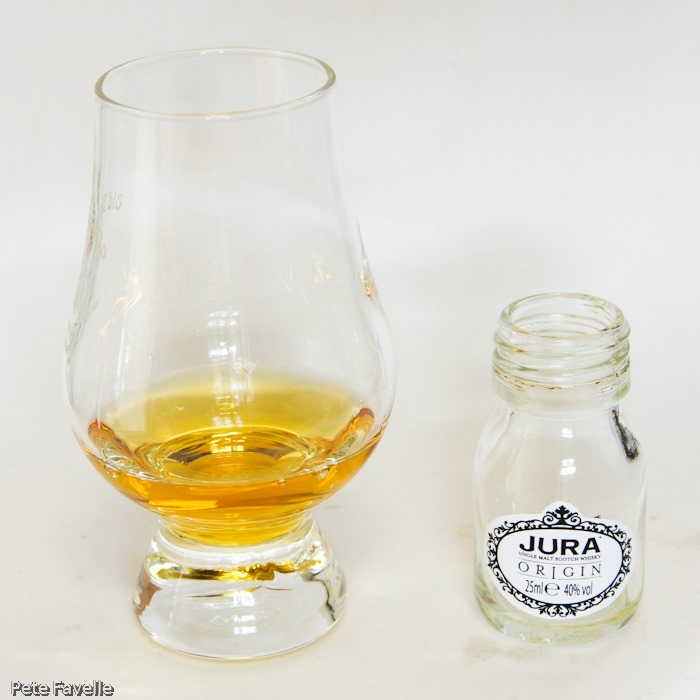 The nose is sweet with honey, with pear drops and a hint of crisp, green apples. Water robs it of much of that sweetness, revealing a touch of oak. In the mouth, rich honey sweetness leads into a smooth, slightly creamy finish which is surprisingly short-lived. 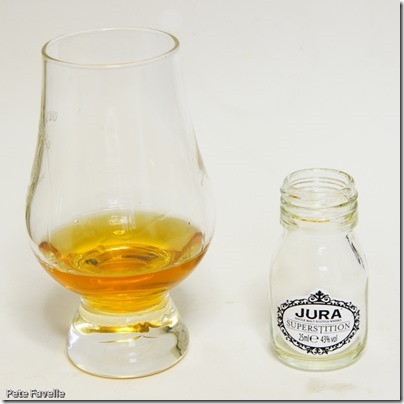 Uncomplicated – almost to the point of being one dimensional – but easy drinking. Water really removes what character it had; don’t water it! Superstition is bottled at a slightly higher 43% ABV, and is comparably priced to Origin. The nose is rich and fruity, almost port-like with some damp wood and just a hint of cold ash. Water brings more of a dried peat tone out along with more of the wood. On tasting, a sweet, almost raisin fruitiness is quickly joined by quite a bitter, slightly resinous edge. The combination doesn’t quite work for me, and that bitter tone lingers long in the mouth. Water softens out the fruit but also brings the bitterness under control. There’s a little honey coming through, and a touch of pepper that makes it far more approachable. Diurach’s Own is back to 40% ABV, but has spent 16 years maturing – the last two spent in Oloroso sherry casks, although the colour isn’t as deep as one might expect as a result. The nose is sweet, with vanilla and oak and under-ripe pears. Water strips the sweetness, exposing untreated wood and a gentle tangerine tone. In the mouth, it’s bigger and bolder than the nose suggests; rich dark chocolate, wrapped around candied orange peel and just a touch of fire at the back of your throat. Water takes away much of that richness; there’s an echo of the candied orange, but it’s overwhelmed by a harsh bitterness that suggests a much younger spirit than the bottle states – certainly in need of more maturing. Once again, water robs this one of too much. Prophecy is the top of the regular range, both in price and strength at 46% ABV. Unlike the rest of the range, this dram has the kind of peaty punch that you might expect to come from Islay’s neighbour. 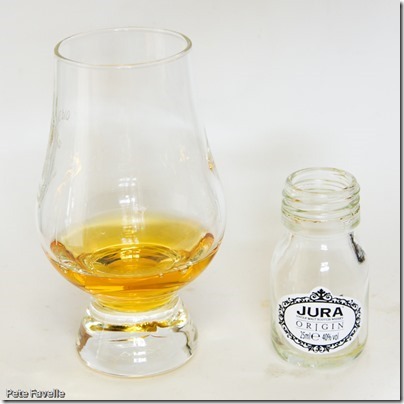 The nose is has a warm peat smoke, damp wood and salt – like a barbeque on the beach. Beneath all that is just a touch of soft brown sugar. Water reduces the smokiness, and brings the salt spray to the fore. An initial fire on the tongue leads into quite a peppery spice and a real astringent edge, like orange pith. Watered, it’s a lot more approachable and open – a slightly sweet start, slowly joined by oranges, tannins and perhaps a touch of chili pepper. It’s greatly improved by the splash of water. Lastly, Tastival is a special edition bottled especially for the ‘tastival’ at 44% ABV. Not much information is provided beyond the use of 7 (yes, 7!) different oak finishes. 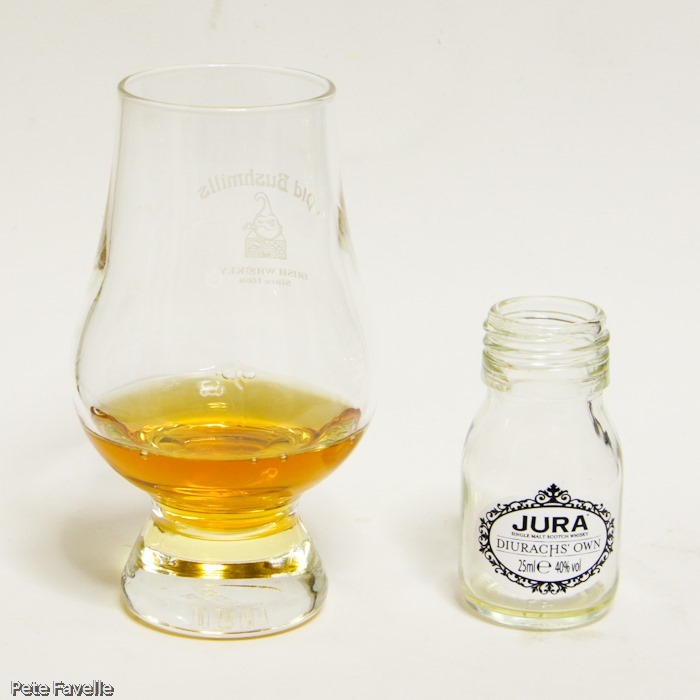 The nose is remarkable sweet; caramel biscuit, and hot buttered toast with an almost gingery spice heat underneath. Watered, the toasty notes are gone and the sweetness becomes cleaner, more honey like. On the tongue, it’s surprisingly delicate – initially sugary, slowly joined by soft, ripe red fruit and just enough tannin to wake your tastebuds up. It’s not overly complicated, but it slips down oh so well. Water brings more character out; the sweet start is cut back and much longer, more complex flavour emerges after – nutty, and with a growing pepperiness that lingers magnificently. 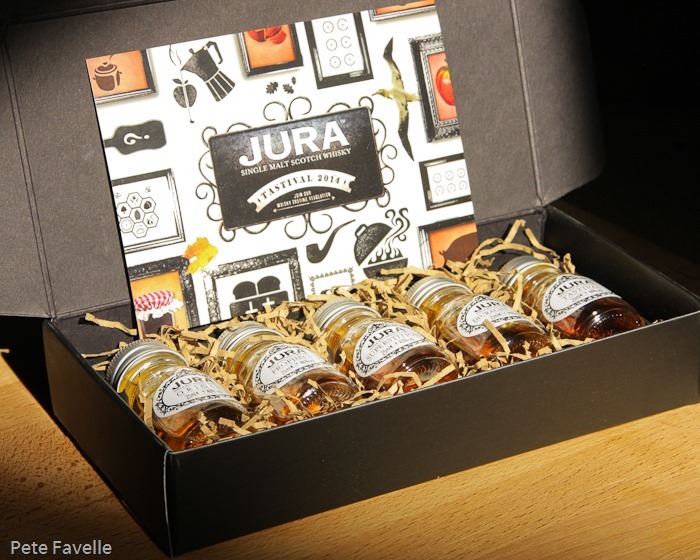 Many thanks to Jura for sending me these samples.